June 7, 2015 – Habamus Bourbon. That play on the Vatican’s traditional announcement of a new Pope was the way one whisky writer at the table described the final selection of a winner in Buffalo Trace’s Single Oak Project Wednesday. While there was no white puff of smoke from the distillery’s smokestack, winnowing down the 192 casks bottled in 2011 to find what Buffalo Trace CEO Mark Brown described as “Bourbon’s Holy Grail” was almost as complex. More than 5,000 people posted tasting notes for 189 of the bottlings (only three received no scores) on the project’s web site, with each being scored an average of 26.5 times. In the end, the results were too close to call, and Buffalo Trace turned to the same panel of whisky writers invited to the 2011 launch (including WhiskyCast’s Mark Gillespie) to pick a winner from five finalists. The project began some 14 years ago when the late Ronnie Eddins selected 96 American white oak trees from a forest in Missouri to be turned into unique casks for the experiment. Each tree was divided into the top and bottom half, and coopers at Independent State made a single barrel from each log. The goal was to examine seven different variables that might affect the flavor of a Bourbon and see which combination produced the best results. In 2003, each cask was filled with spirit from one of the distillery’s two main mashbills, one rye-focused and one wheat-focused, placed in two specially selected warehouse ricks, and left to mature for eight years. The casks were all bottled at the same time in early 2011, and released in batches of 12 at a time four times a year, with the final release coming this past April. While distillers have been able to make educated guesses at the impact of some of the variables on the final whiskey, others have been a mystery. “We knew about char, we didn’t know very much about grain type, and we knew nothing about top half of tree and bottom half of tree…and there are some clear patters in the data to suggest that bottom half of the tree actually has made more winning score whiskies than the top half of the tree,” Buffalo Trace CEO Mark Brown said in an interview. 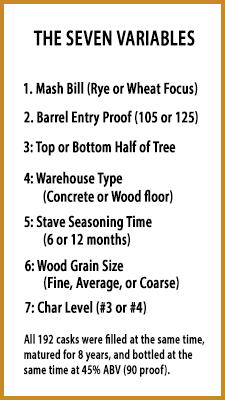 The winning cask of the five finalists, #80, was released in the spring of 2014 and had a rye-focused mashbill with 12 months of stave seasoning time, average grain size, 125º entry proof, #4 char, wood from the bottom half of the tree, and was matured in a warehouse with a concrete floor. Ironically, that recipe is almost exactly like the one used for Buffalo Trace’s namesake Bourbon, according to Master Distiller Harlen Wheatley. “I need to look at all the data, but the one difference that I saw was the seasoning of the wood…it was a 12-month seasoning,” he said, noting that the distillery normally uses casks with staves seasoned for six months and randomly selected from multiple trees with no distinction between the top and bottom half. The other four barrels selected as finalists were #82, #109, #161, and #179. While the distillery team will spend the next several months parsing all of the data from nearly 1,400 different variables as well as the thousands of ratings and tasting notes submitted by consumers, the plan is to start trying to replicate the specific recipe for Cask #80 and start laying down stocks of whiskey to be released starting eight years from now under the Single Oak brand. However, the experiment may also lead to other new whiskey expressions, according to Mark Brown. “It’s turned out to be very fertile ground, and a lot of interesting ideas have been thrown up as a result of the world,” he said. In addition to Harlen Wheatley and WhiskyCast’s Mark Gillespie, the 10 members of the tasting panel included Liza Weisstuch (Whisky Magazine), Chuck Cowdery (The Chuck Cowdery Blog), F. Paul Pacult & Sue Woodley (Spirit Journal), Lew Bryson (Whisky Advocate), Gary Regan, Jason Wilson, Christopher Null (DrinkHacker.com), and Jim Myers (The Tennessean). All of the panelists were part of the original Single Oak Project launch panel in 2011, with the exception of Gary Regan and Christopher Null. Jim Murray was part of the original panel, but was unable to attend the final tasting. 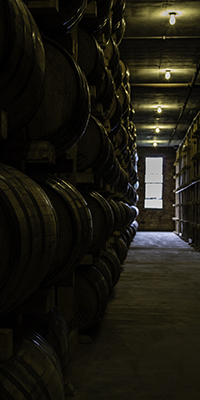 The complete interview with Buffalo Trace’s Mark Brown is available in Episode 538 of WhiskyCast. Editor’s note: While Buffalo Trace covered travel expenses for WhiskyCast’s Mark Gillespie and most members of the tasting panel, full editorial control over the content of this story remains with WhiskyCast.